The card game Piquet is a fun, multi-style game played with 2 players. Score points through card combination and taking tricks. 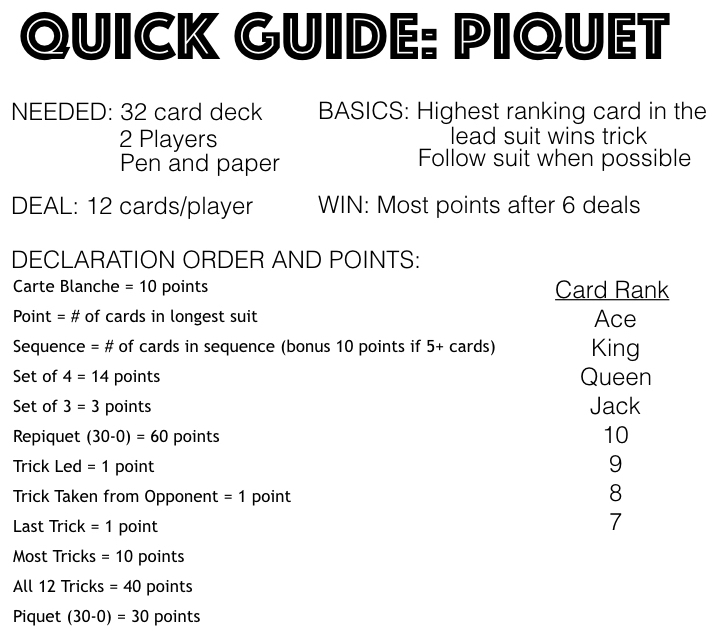 Be sure to keep the Piquet quick guide close while playing for a quick reference to help you learn as you play! Below is the video tutorial and explanation. Deal: Each player is dealt 12 cards in sets of 2 or 3 cards. The remaining 8 cards are placed into the middle. Objective: The object of the game is to score the most points from 6 deals. Points are scored through card combinations and winning tricks. Game Play: The combinations that score points are the Point, which goes to the player with the most cards in a single suit. The Sequence points go the player with the longest sequence of cards in order and in the same suit. A Sequence must be at least 3 cards in length. The Set points go to the player with the highest ranking cards in a set of 4 or 3. During the trick taking phase, points are scored by leading a trick, winning a trick that your opponent led, winning the last trick, and winning the most tricks. Each player gets a chance to exchange cards with cards from the remaining deck. The non-dealer is first to exchange cards, and can exchange 1-5 cards. The dealer then gets to exchange up to the amount of cards left. The non-dealer is first to declare the combinations in his/her hand to try and score points. Only the player with the best combination in each category scores points for that category. After the non-dealer declares for a category, the dealer will announce good, no good, or equal. Good means the non-dealer’s combination is better and can be scored. No good means the dealer’s combination is better and the non-dealer doesn’t score for that combination. Equal means that additional information is needed to determine the winner. When both players have an equal Point combination, the player with the higher value of cards in the point suit wins. The value is determined with aces being worth 11, kings through tens being worth 10, nines are worth 9, eights worth 8, and sevens worth 7. When equal on Sequence the player with the higher ranking card starting the sequence wins. When equal on Set, the player with the higher ranking card in a set wins. A set must have a rank of 10 or higher. After the non-dealer is done declaring, he/she will play a card into the middle to lead the first trick. Before the dealer plays on the trick, he/she will declare his/her card combinations. Once the dealer is done declaring, he/she will play a card into the trick. Players must follow the lead suit when possible. The player with the highest card in the lead suit wins the trick. The player that wins the trick leads the next trick. If a player is dealt no face cards, it is known as carte blanche. Carte Blanche must be declared immediately and shown to your opponent. 10 points are awarded for the carte blanche and then the game continues with the card exchanges. If a player scores 30 points before the other player scores any points during the declaration phase, a bonus of 60 points is received (known as Repiquet). If a player scores 30 points before the other player scores any points after going into the trick taking phase, a bonus of 30 points is received (known as Piquet). If during the declaration there is an equal call for point or sequence, and a tie in point value or sequence rank, no points are awarded for the category. Win: Most points after 6 deals.